For the second year, Absolute Exhibits has partnered with Wulff Entre to construct the Norway Pavilion for Offshore Technology Conference 2016, held May 2-5, 2016, in Houston, Texas. Country pavilions have been notable highlights in the Absolute Exhibits project portfolio throughout the years. Absolute Exhibits, a full-service trade show exhibit design and fabrication company with offices in Las Vegas, Orlando, and Southern California, will be constructing the Norway pavilion exhibit for Wulff Entre of Finland with over sixty Norwegian exhibitors at the Offshore Technology Conference 2016 (OTC). The Norway Pavilion exhibit is a substantial undertaking as it will showcase over sixty exhibitors and include a luncheon to be cooked onsite each day on the top deck to feed 1,500 attendees over the course of the trade show. OTC focuses on state-of-the-art technology for offshore drilling, exploration, production and environmental protection. OTC is the world's foremost event for the development of offshore resources and one of the most important global offshore events with more than 100,000 industry leaders from more than 110 countries in attendance. 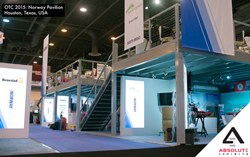 Absolute Exhibits is a leading provider of trade show exhibit rentals, including custom exhibits and pavilion exhibits, for foreign exhibitors at US trade shows. The company offers a complete one-price exhibit package, which includes display hardware, graphics, furnishings, A/V equipment, flooring, installation and dismantle, and shipping to and from the show. For more information on exhibiting in the United States, contact Christina Corbin at (714) 685-2845. Wulff Entre Ltd. is located in Helsinki, Finland and concentrates in turnkey solutions at trade shows and events globally. Spanning over 90 years, Wulff Entre is a specialist in exhibition and event marketing. They offer planning and design for clients to exhibit in hundreds of marketing events and trade fairs every year around the world. A leading exhibition firm, Absolute Exhibits provides clients with turnkey solutions for designing and fabricating exhibits while managing the entire trade show experience as a one-source trade show and convention exhibit resource. Established in 2000, with locations in Southern California, Las Vegas, Orlando, and Bucharest, Absolute Exhibits rents and sells custom and system exhibits at over 300 shows in the USA and countries around the world.